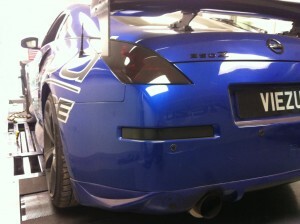 Since its launch there has always been seriously high demand for Nissan 350z Tuning, The now almost legendary Nissan 350Z is a great car, but until now almost all tuning has had to be by way of piggy back ecu tuning, not ideal on a new vehicle, and whilst acceptable to some customers, many have been waiting for OE Ecu remapping for the Nissan 350Z, and now it’s here for the first time. Last week, whilst some of the team were off training and tuning in Russia, the tech guys had the chance to get to grip with the Nissan 350z, armed with the very latest tuning software, the Viezu 3000bhp rolling road and emission equipped dyno research and development cell, the Viezu tech team were able to download the full ecu of the 350z, and reprogram it for the first time. The tuning of the Nissan 350Z ecu is a major breakthrough, for the first time the stock ecu of the 350z can be tuned, offering full custom tuning and ecu remapping. Viezu take tuning very seriously, as well as winning awards, all tuning comes with international insurance, money back guarantee, and is fully custom written to the customer’s requirements, not just some flash tune that is downloaded time and time again from a nameless faceless database.